Yesterday I visited the amazing studio of artist Nancy Schon, best known around Boston for her statues of Make Way for Ducklings in the Public Garden. 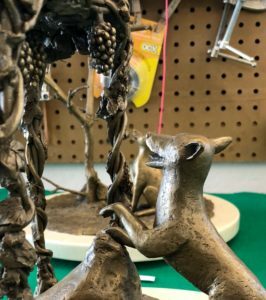 She’s been working on a series of sculptures based on Aesop’s fables, and this view of the fox and the grapes caught my eye. It’s been a long time since I considered these fables, but this one is familiar to many: the fox sees some delicious grapes hanging from an arbor, yet despite leap after leap they remain out of his grasp. Finally he turns away, declaring that he didn’t want those sour grapes anyway. I am usually an earnest person, sometimes overly so. But lately a few sour grapes have crept into my commentary, in a sneaky silent way – mostly in my own head. The stock I didn’t buy that’s up 30%, but surely not of high quality. The government that I wish were noble, but now dismiss as eternally ineffective. The friendship I didn’t pursue with the person whose flaws are now more vivid that their virtues. Sour grapes don’t have to be loud or whiny to be destructive. They allow us to dismiss what is secretly most dear. Friends, when we catch ourselves in dismissing mode, let’s try to pause, to see what’s really being case aside. The best grapes of all might be right there, waiting for us to recognize them.